The FC Kansas City forward scores a brace and provides an assist to help the Blues earn a crucial victory to stay in playoff contention. Shea Groom has been voted as the NWSL Player of the Week. In a game that FC Kansas City needed to win as they have made a late season comeback to stay in playoff contention, specifically after going on a nine-game winless streak all summer, the Blues faced the same Sky Blue FC team who left them stunned back in July after a Sam Kerr hat-trick in 12 minutes eradicated their 2-0 lead. 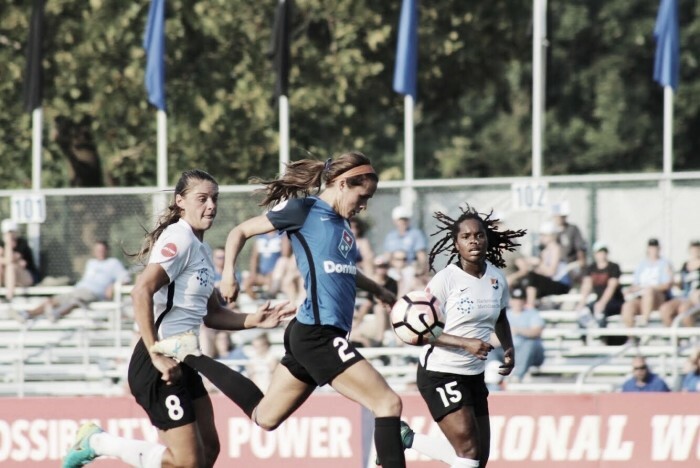 There would not be late-game heroics from Sam Kerr and the New Jersey-based team as Kansas City earned a decisive 4-1 victory. Two of those goals and an assist on one of those goals came from Groom, giving her four goals and six assists for the 2017 NWSL season. In the last four wins for the Blues, Groom has contributed significantly by scoring or assisting on the game-winning goals. In the 39th-minute, with the game deadlocked at 0-0, a kick from goalkeeper Nicole Barnhart found Sydney Leroux whose header bounced towards Groom. The Liberty, Missouri native dribbled the ball into open space beating the Sky Blue defense. Instead of taking a shot, Groom found midfielder Lo’eau LaBonta for a cross, and LaBonta, who was left unmarked, was able to send the ball in for the Blues' first goal. Five minutes later, on another Barnhart kick from the box, the ball bounced in the midfield towards LaBonta, who sent a backward pass over her head to the front where Groom made the run. Groom's speed was too much for the Sky Blue defenders, and her strike soared past Sky Blue goalkeeper Kailen Sheridan into the left side of the goal for the 2-0 lead. In the second half, in the 64th minute, Groom completed her brace for a Kansas City 3-0 lead after an assist from midfielder Desiree Scott. Groom waited for the cross from Scott for a toe-poked shot. Even though Sheridan initially made the save, the rebound bounced back to Groom for the goal. This is the second time that Groom earns Player of the Week honors. She last won the weekly award in 2015. Groom is also the second FC Kansas City player to earn the honors this season. Sydney Leroux was named Player of the Week for Week 7.